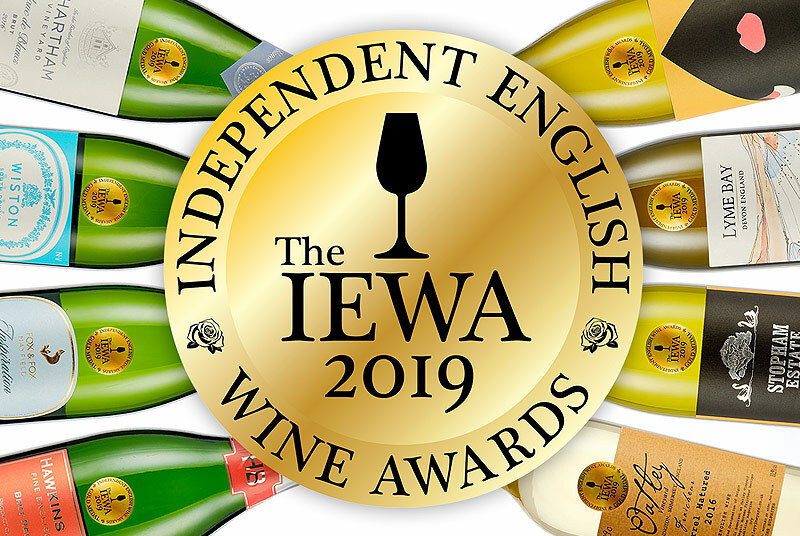 It’s wonderful to see a new found respect for English Wine, not just from the media and the public, but also from chefs, sommeliers and restauranteurs. 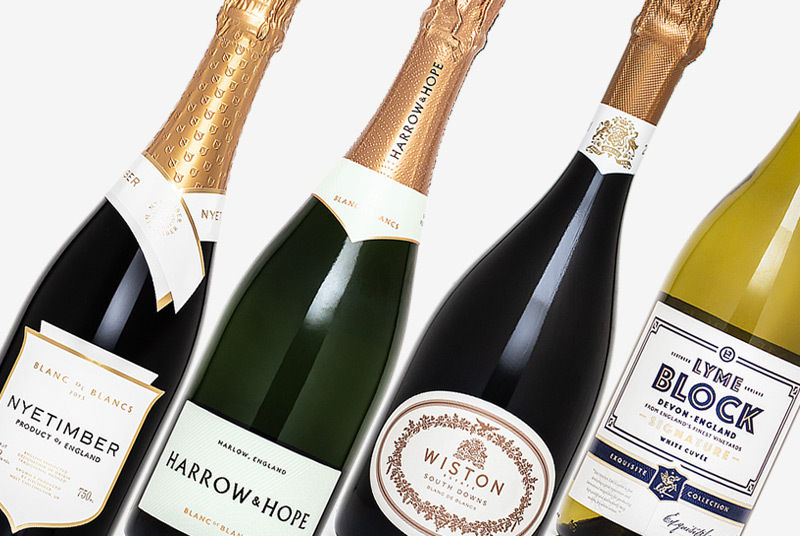 English Wine is no longer just seen as a niche afterthought on a wine list – we have a large group of winemakers producing a huge range of diverse and fascinating still and sparkling wines. 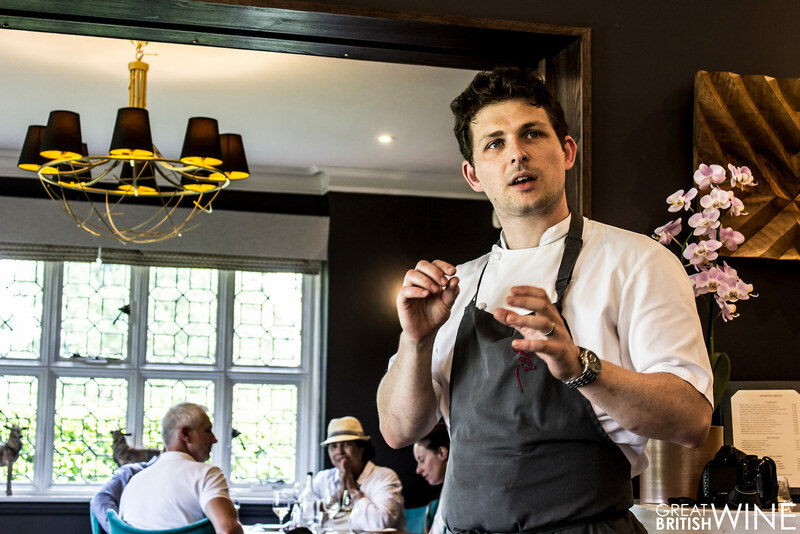 Phil Fanning of Paris House in Woburn, working with Kent producer Chapel Down, has devised a 6 course menu that absolutely celebrates the best of English produce and wine. 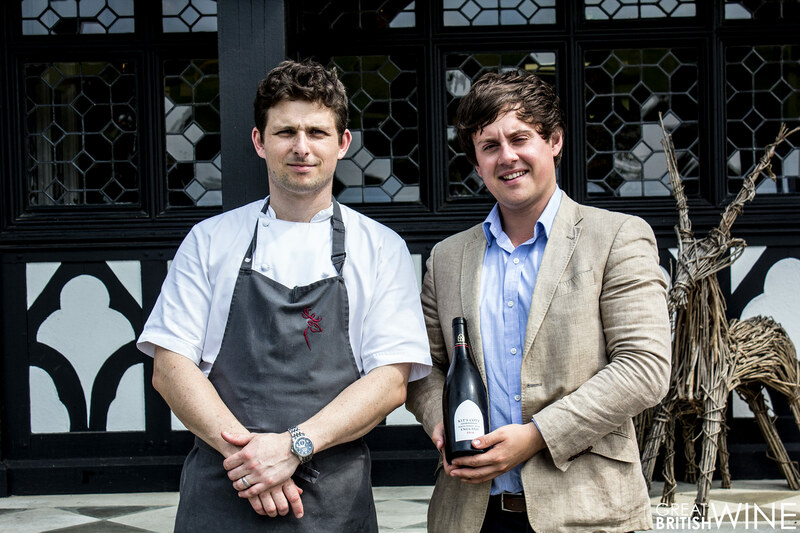 Great British Wine was invited to Paris House to celebrate the launch of this menu, which will run at Paris House for lunch service until September 3rd. Paris House itself is a stunning restaurant venue. A grand approach takes you through a grand gated entrancing through herds of deer grazing on expansive grassland. The restaurant is owned by Phil Fanning. He initially worked under Alan Murchison at L’Ortolan, before becoming head chef at Paris House when it was under Murchison’s ownership in 2010. Phil earnt a Michelin star at Paris House within his first year, and went on to buy out Murchison in 2014, making him Executive Chef and Owner of the restaurant. 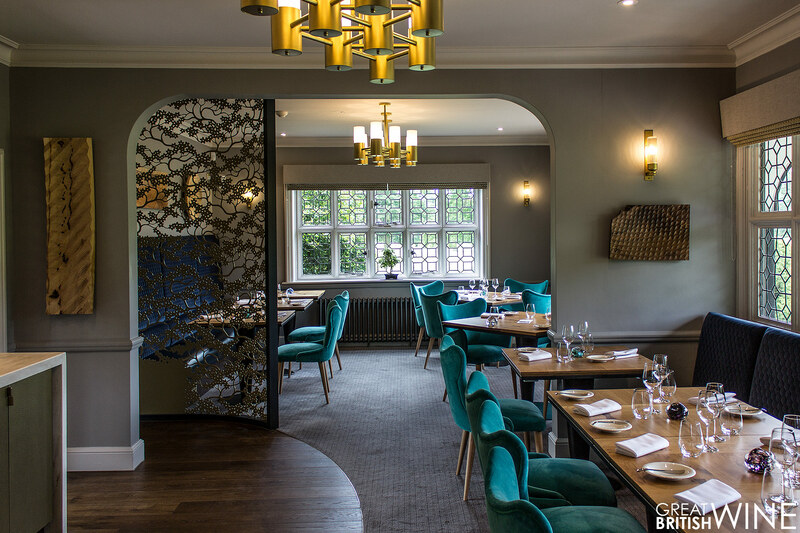 The venue has recently undergone a significant refurbishment and was relaunched in April, decorated in tasteful minimal style with a fusion of old and new. Flourishes embellishing both the building’s history and Phil’s fascination with nature and all things Asian set the stage for what was to become a fascinating journey of food, texture and wine. 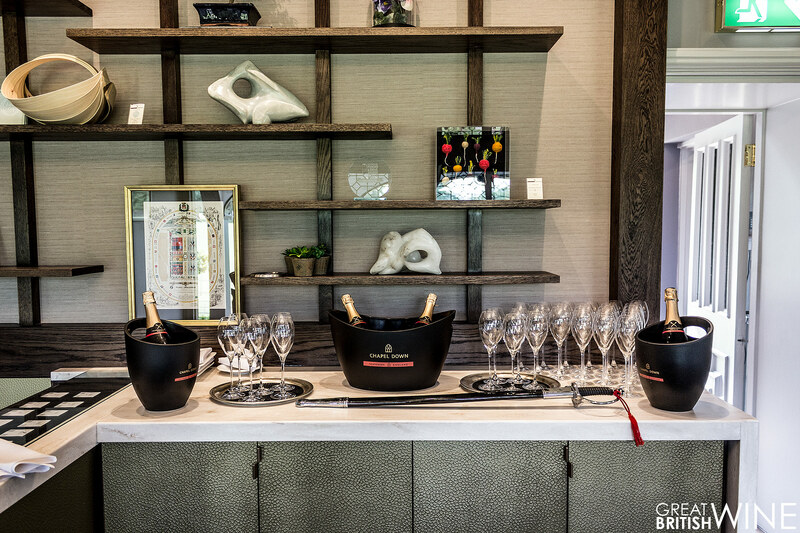 Upon arrival, lunch guests were treated to a glass of the superb Three Graces 2011 (£29.99 – Chapel Down), a classic blend of Chardonnay, Pinot Noir and Pinot Meunier. Coming from a fantastic vintage, this elegant sparkling wine is one of my favourites in the main Chapel Down range. The Three Graces exhibits beautiful integration of crisp red apple with brioche and nutty complexity. I had arrived at Paris House early, so took the chance to have a good chat with James McLean, our host for the afternoon. I first met James early last year when he was hosting public tours of Chapel Down – and doing a stellar job of it. James’ natural ability to engage and enthuse has led him to be promoted to Brand Ambassador. 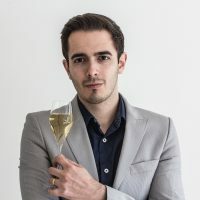 With a strong focus on premium wine sales following on from the launch of the Kit’s Coty range a few months back, James has been instrumental in numerous high-end wine listings including Le Gavroche and Paris House. 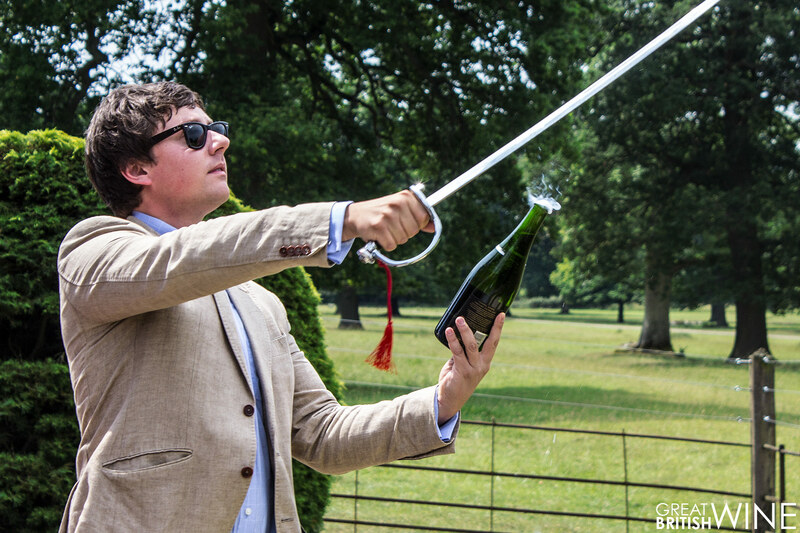 A masterful demonstration of sabrage by James (as well as a reluctant volunteering diner) perfectly completed an opening speech explaining both Chapel Down's and the English wine industry’s progress. We had a chance for another glass of the Three Graces from the just-sabred bottles to accompany unique canapé’s including a delicious rabbit kofta, before we invited to take a seat in the restaurant. You know a meal is going to be special when even the butter served with the bread impresses and defies convention. Three flavours were served; Hummus, Taramasalata and Marmite, the latter of which had strong yeasty notes that paralleled those we experienced in the Three Graces. 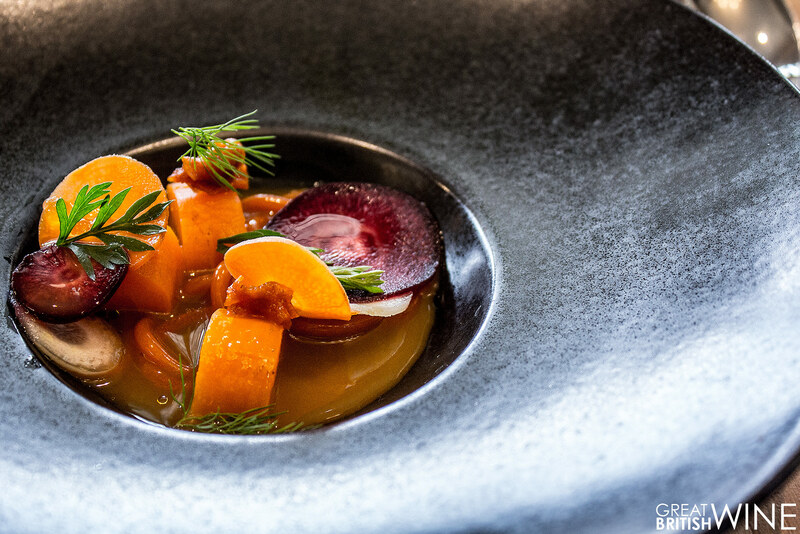 The first course served was a stunningly pure exploration of carrot, including carrot spaghetti, heirloom carrots dressed with refreshing cold pressed juice. I’ll admit that I’m not a huge carrot lover, but this dish was a revelation with its curious textures and striking purity. Hints of dill throughout the dish helped to bring out herbaceous characters in the paired wine, the Chapel Down Flint Dry 2016 (£11.99 – Chapel Down, Waitrose). 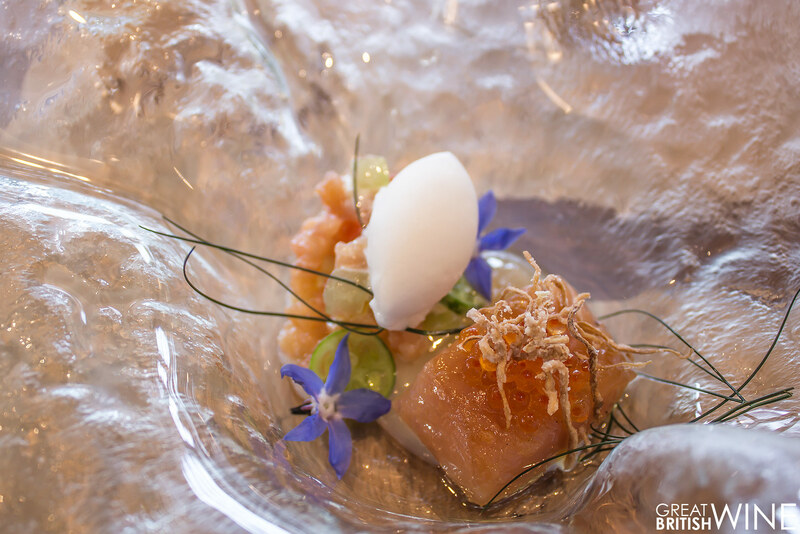 The second dish of cured and confit of trout was another beautiful demonstration of purity. The trout so tender it literally melted in the mouth, embellished with flavours of quinine, crispy ginger, grapefruit and compressed cucamelon, which was completely new to me. This dish was paired brilliantly with Chapel Down’s Bacchus 2015 (£12.99 – Chapel Down, Waitrose), with its grassy character, striking citrus cut through and tropical fruit flavours contrasting the salty flavours of the sea. The third course, playfully named ‘KFV’ (as in Kentucky Fried Veal) was a revelation thanks to a pairing with what is my favourite of all of Chapel Down’s wines – the Kit’s Coty Chardonnay 2014 (£30.00 – Chapel Down). 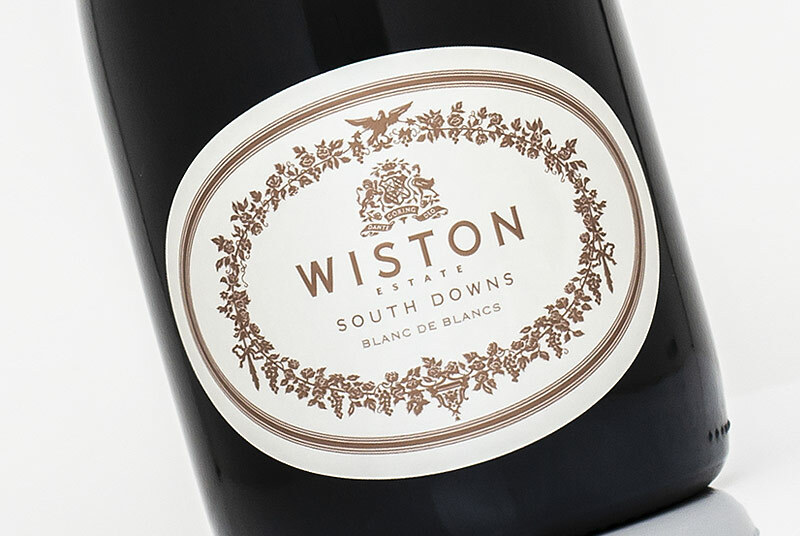 This stunning Chardonnay is one of the most refined English still wines on the market, with its expertly judged oak integration and mouth coating textures. 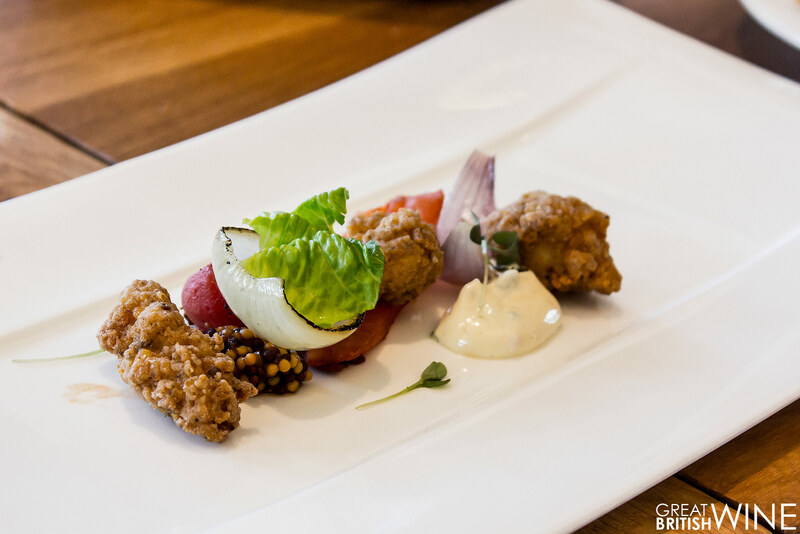 The Kit’s Coty and the crispy veal sweetbreads were a match made in heaven. I describe this wine as something in between the richness of a white Burgundy – think buttered toast and soft stone fruit, whilst retaining a crisp pure Chablis-like fruit expression. The wine was universally enjoyed throughout the dining room and proved to be a real eye-opener to diners on how far English wine has come. Throughout the meal James and Phil each spoke about their respective wine and food offerings. 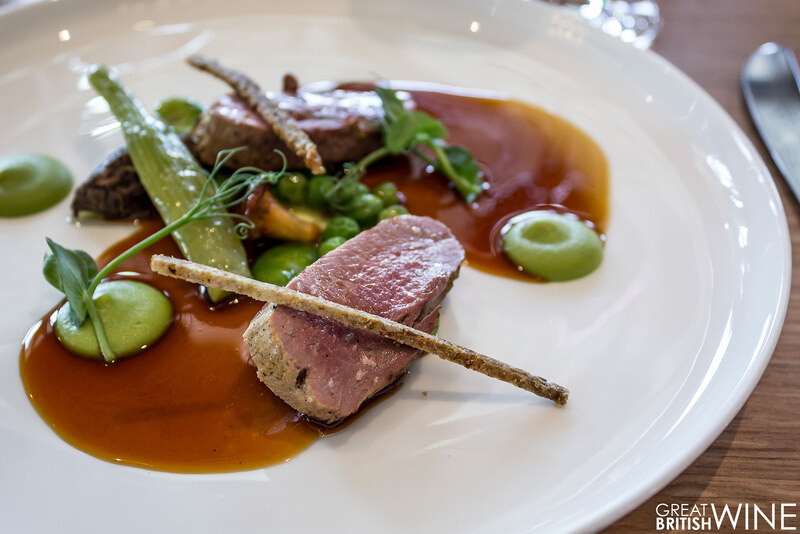 They gave great insights that made the whole experience feel much more interactive, whilst the relaxed but expertly delivered service kept the guests comfortable and never lacking.On to the next course; Duck with peas, broad beans and fennel. Phil had prepared the duck in a traditional tandoor style, brined in yoghurt and spice before being gently cooked. The supple duck breast was delicious with flavours of fennel and spice running through it all, and this time we were treated to an English red wine – Chapel Down Union Red 2013 (£12.99 – Chapel Down). A blend of Pinot Noir and Rondo, this is a medium bodied red with surprising richness thanks to the dark skinned and early ripening Rondo. The lovely spiced smoky notes of the wine partnered the rich savoury rich flavours of the duck and fennel emulsion brilliantly. The diners seemed very impressed with this pairing, many probably experiencing an English red wine for the first time. The meal concluded with a duo of desserts. 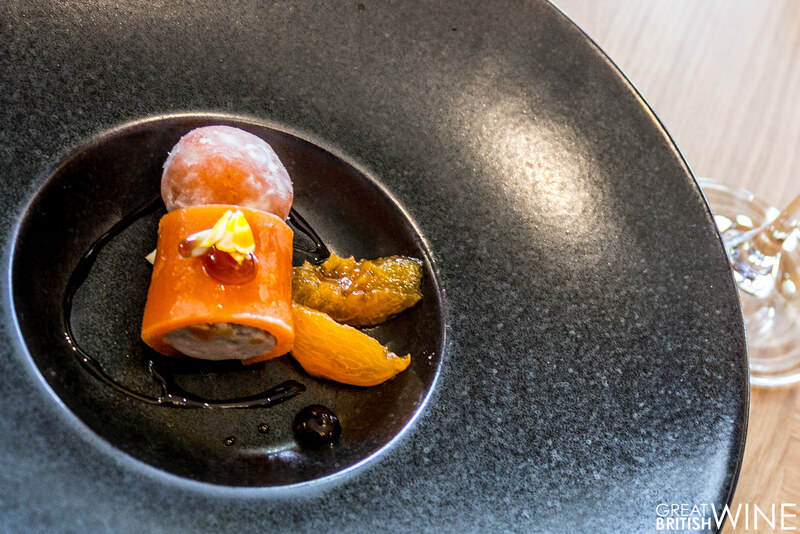 Firstly, and another Asian influenced dish; Apricot Mochi with sweet apricot and Kuromitsu, which is a Japanese sugar syrup made from brown sugar. This dish was a fascinating fusion of Asian dessert textures with western fruit flavours, and paired with an apricot Bellini made with the off-dry Chapel Down Century Extra Dry (£23.99 – Chapel Down). If that dish wasn’t enough of a exploration of one ingredient, then things were cranked up to the next level with the sixth and final course. 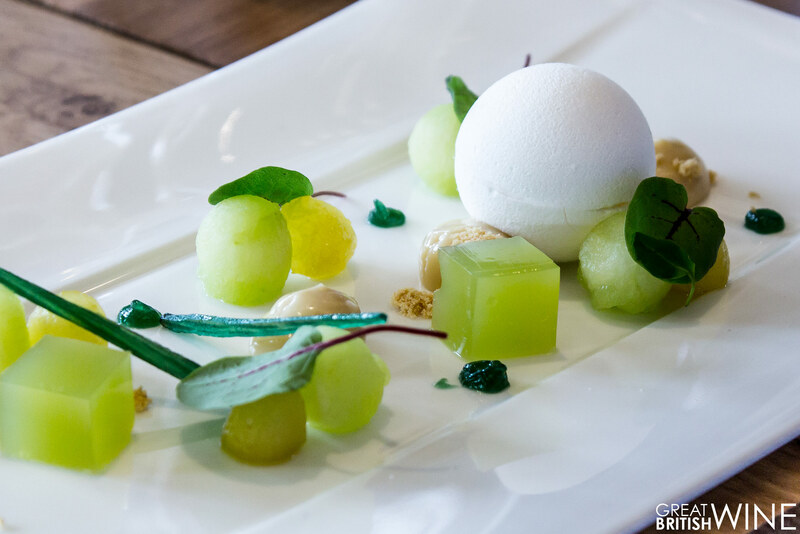 This course was essentially a “celebration of apple”, with a selection of fresh apple, apple jelly and a delicious buttermilk filled meringue. Candied angelica added a gentle floral character but didn’t detract at all from the uber-pure apple expression. The final drink pairing was not a wine, but in fact Curious Apple Cider (£1.99/bottle – Waitrose). What makes this cider special is that it is made from 100% fresh Rubens and Bramley apples hand-picked in Kent. 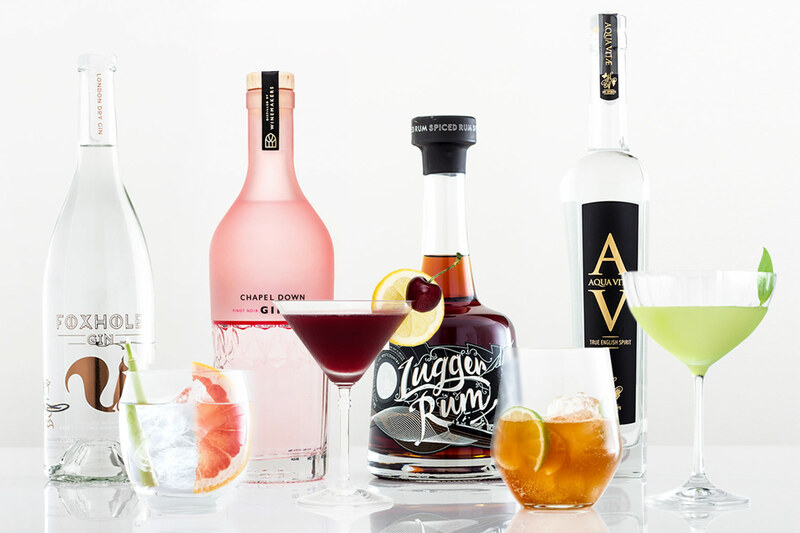 No concentrates or dilution – just pure fruit and production techniques that mirror the winemaking expertise. This was a perfect pairing and a brilliantly refreshing end to an eclectic lunch menu – perhaps the ultimate demonstration of pure and precise food and drink pairing. As the meal drew to a close, it was brilliant to see so many of the diners come up to James and Phil and express their satisfaction with both the food and the wine. With Chapel Down placing wines from both their core and premium ranges and the surprising cider pairing, it shows just how versatile Chapel Down’s range is. 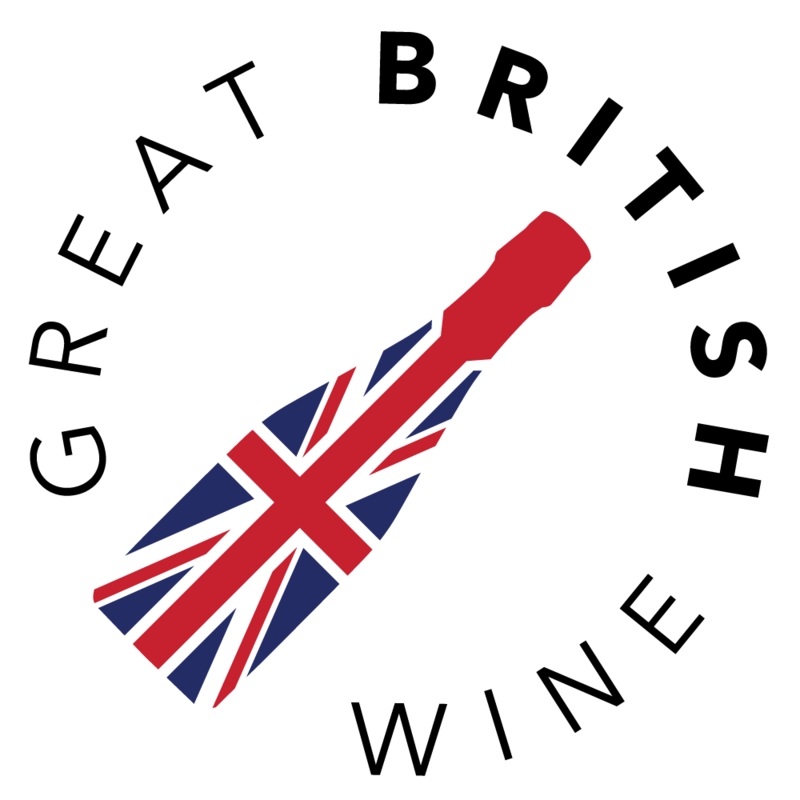 It also again demonstrated how and why any self-respecting British restaurant must get English wine on their menu. A huge thanks to James and Chapel Down and to Phil and his team at Paris House for inviting me for a very memorable lunch. With such a diverse menu of both food and wine, it’s difficult to capture it all in a single article. My best advice would be to head over to Paris House and experience it yourself. The menu is running at lunch times until 3rd September, priced at £43 for 6 course with optional 4 or 6 glass wine flight at £36 and £49 respectively.